A few weeks ago I posted the pic of Jessica Hart below and afterwards thought that her Saint Laurent Tribute sandals (also here) look fresh, again. 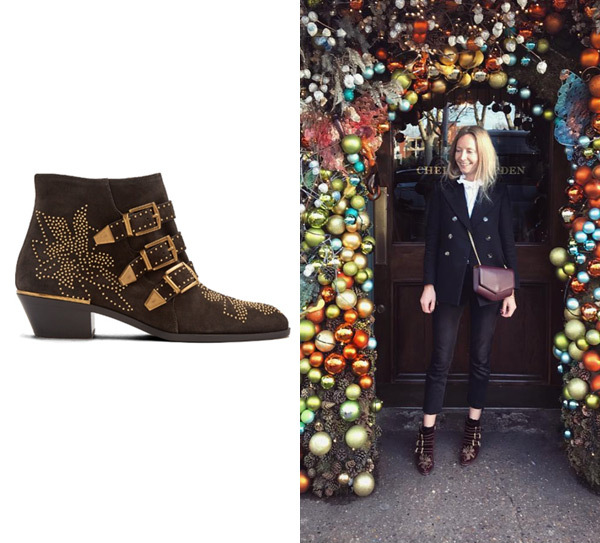 Then I spied stylist Martha Ward in a pair of Chloé Susanna ankle boots (also here) and had an ‘aha’ moment. I didn’t buy either when they first came out and were all the rage, but they both look great now. I have owned a pair of the Chloe Sussanas in black/gold for several years now. I wear them any opportunity I get. Always receive numerous compliments, and they are incredibly comfortable. Have always admired the Tribute sandals. The Chloe boots are a forever piece, in my opinion. Despite not being at the height of the trend, I purchased a pair of tribute sandals (lower heel, black patent) just last year. They have become one of the most loved items in my closet – they are beyond comfortable. I was told at the Saint Laurent store in Chicago that the tributes continue to be the number one seller, mostly because women can actually wear them without being in pain. What is more chic than that! Yes to the Chloes, always wanted a pair. I can live without the Tributes! I actually just bought a pair of Rockstud flats and laughed that I’m five years late for the trend. The reason I finally did it, though, is because I no longer see every third person wearing them. Isn’t that why you got rid of yours a couple years ago? Yes, I gave away 2 pairs and kept my favorites. Was thinking of taking them out again—thanks for the reminder! I bought the lower (3.5″?) Tributes in black and brown when they came out. I find myself reaching for them every summer over newer options. They just work. What Goes Around Comes Around, Cont.